United States Women’s National Team soccer coach Jill Ellis wasted no time naming her roster of 23 for this June’s women’s World Cup held in Canada. Ellis had until May 25 to submit her roster to FIFA but felt very confident in her decision so she called each player individually to share the news. Ellis had this to say about her roster. The team is comprised of 16 players with previous World Cup experience led by center back Christie Rampone who is 40 and playing in her 5th World Cup. Players making their World Cup debuts are two-time Herman Trophy winner Morgan Brian, goalkeepers Ashlyn Harris and Alyssa Naeher, defenders Whitney Engen, Julie Johnston and Meghan Klingenberg, and forwards Sydney Leroux and Christen Press. 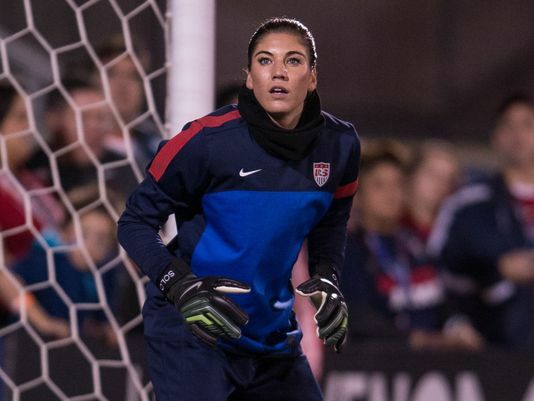 One of the returning players who may have been sweating out whether she would be selected was goalkeeper Hope Solo. While she is arguably the top female goalkeeper in the world, Solo was suspended for 30 days by U.S. Soccer in January after her husband was arrested for driving under the influence while driving a U.S. Soccer Federation van. Solo was in the van and argued with police after the traffic stop. This incident came a month after domestic violence charges were dropped against Solo for an incident last summer with her sister and nephew. U.S. Soccer and Ellis decided Solo needed to get her life in order before continuing with soccer. In her absence, the U.S. lost friendlies to France 3-0 and defeated England 1-0. After the suspension was lifted, Solo returned for the Algarve Cup. She was in net for all four games registering two shutouts and giving up only two goals as the U.S. won the Algarve Cup. When Solo was first suspended, I wrote that I thought her time with the national team should end because she was constantly making poor choices. Playing for your country is an honor, but also a privilege that should be earned. I thought Solo was incapable of changing and the U.S. should move on to another keeper. However, my thoughts have changed on the subject. Solo has been in therapy since the suspension and has a much greater appreciation for her teammates and career. Hopefully, Solo’s changes are permanent and she does not revert back to her old ways because the U.S. is a much better and more confident team with her in net. « Has Van Gaal found Rooney’s True Position?